Trek to the world's third highest peak Mt Kanchenjunga, Base Camp at 5,140m (Eastern Nepal), visit HDFA projects and exit via helicopter flight with a scenic overflight of the entire Everest Base Camp trek and Khumbu Icefall. WOW !! Snow Leopard Heli-Trek in 2017 incorporate trekking to Base Camp of the world's third highest peak Mt Kanchenjunga Base Camp at 5,140m (Eastern Nepal) and exit via helicopter flight with scenic overflight of the entire Everest Base Camp trek and Khumbu Icefall. WOW !! Helicopter pickup from Kanchenjunga region with Everest Valley Scenic flight - ALL INCLUDED. This trek provides a rare opportunity to visit the Kanchenjunga region in Eastern Nepal, starting off in the low plains and tea plantations of Eastern Nepal and trekking into the upper reaches of the Himalayas in the shadows of the world’s 3rd highest peak, Mt Kanchenjunga. Mt Kanchenjunga lies on the India/ Nepal border close to the well known Darjeeling area of India and is visited by only a few hundred trekkers a year. It is one of the last bastians of the rare Snow Leopard and one of the last places in the world to see these rare and mythical creatures (with luck!). We visit some of HDFA's education projects: in and near the village of Ghunsa and another project outside Kathmandu near the Tibet border. On the trek we travel by mountain paths used by the local people to cart their goods but it is too rugged for roads. We aim to trek to the Base Camp at 5,140m on Mt Kanchenjunga before flying out of the village of Ghunsa at 3,400m elevation in 6-seater twin engine helicopters. This will provide stunning mountain scenery that only the Himalayas can dish up with 8,000m high mountains towering above us. On the way back to Kathmandu we detour via the Khumbu (Everest) Valley to overfly the entire Everest Base Camp trek and, weather permitting, overfly the Khumbu Icefall and Camp One on Mt Everest itself!! This is one of the most stunning helicopter flights on the planet. Have a look at this YouTube video. Weather dependent of course! 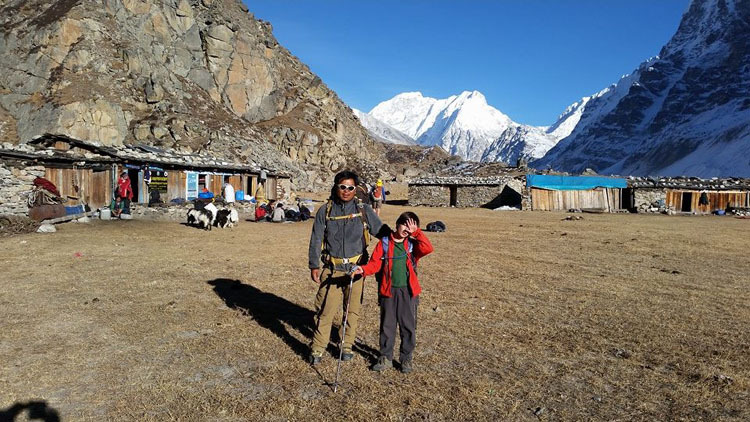 The purpose of the Himalayan Development Foundation Australia is to raise funds to support projects that educate the children of Sherpas who live in remote locations of Nepal and provide for sustainable development to benefit the whole community, with an emphasis on education. This trek provides a rare opportunity to visit these very regions and see some of the education projects, in and near the village of Ghunsa. It also happens to be in one of the last bastions of the elusive snow leopard. Your participation will raise funds to support the work of the Foundation in these remote areas in the years to come. The trek itself will provide a personal, physical and mental challenge guaranteed to take you out of your comfort zone. We will stay in local teahouses which provide an authentic Nepal experience – trekking is only in its infancy in this remote area of Nepal. During the day you might stop for lunch at a teahouse or often carry light snacks to eat for lunch on the big days to speed things up. Your Sherpa guides and porters will be with you all the way. Your porter will carry the bulk of your clothes and equipment whlie you carry a daypack of 7-8kg. We expect to take a maximum group size of 14 team members. In addition to the group will be your trek leaders and local support crew (porters, guides). 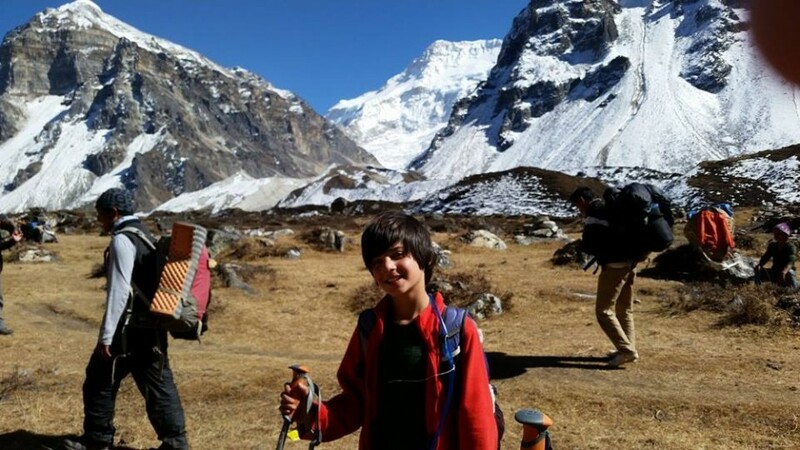 We recommend the trek as suitable for children over the age of 10 who are mentally strong and physically capable of exercising for trek days of 5-8 hours. A parent or guardian must accompany them. 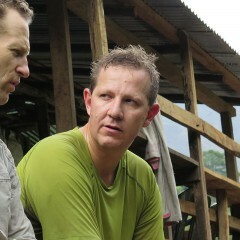 We have successfully trekked with children to the Base Camp at 5,140m. The holiday costs are not tax deductible, however the donation to the HDFA is 100% deductible. That's government legislation. Please contact us to receive the full trek itinerary and information package. To make it clear, HDFA is not operating the trek. HDFA is not operating the aeroplane either… You can begin booking any of the three parts at any time, but all three will need to be completed before your journey commences, thanks.